Via: reuters.com: Michael C. Hall, who won a Golden Globe and Screen Actors Guild award for his role on "Dexter" and who previously appeared in "Six Feet Under," joins the "Ruth & Erica" cast on Wednesday as Tierney's loser, ex-drug addict realtor and would-be boyfriend. 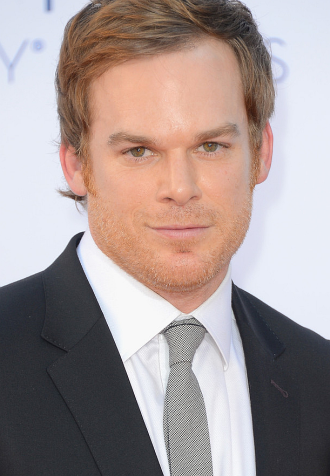 Hall, 41, spoke with Reuters about switching gears for a new comedic role, the new season of "Dexter," and foot tattoos. This is not your usual TV show - was that the appeal? "Absolutely. The format is unique and you can tell the story in much briefer sketches than in series TV. Each one is just five to seven minutes long, and I did three of them. And then there's the amazing cast, the fact that it won't take over your life for five or more years if it's successful like a network show, and the writing (by "Party of Five"'s Amy Lippman) was so strong and compelling." The loser realtor is another juicy role for you. How much of you is there in him? Your character's beard is a nice touch. Whose idea was that? A: "I just happened to have one when they called me about this, and Amy and I just decided it really fit the character." Despite all the humor, the WIGS show tackles some serious issues - aging parents, illness, healthcare. "Exactly, it tackles those baby boomer fears about getting older and our parents getting sick and how we adjust to that. And my character, like the others, feels the wheel of his life turning in a way that makes him realize that when you lose your parents, you're next." Have you gone through a similar situation in real life? "My mother's still alive but my father passed away when I was still quite young. She's thankfully in very good health, but you do feel a sense of the finite time that remains for them, and then the finite time you have left. The show did make me think, and I feel very thankful for the relationship I have with my mother." Is doing an Internet show like this very different from a network or cable show? "Not really. It's pretty much the same process and we moved at a comparable pace - but with a smaller crew. I'd definitely do it again." It's season 7 for "Dexter," and there's quite a situation now between Dexter and his sister Debra, who's onto his secrets. Has that re-energized the show? "It really has, and we all feel so excited about it now the playing field has fundamentally changed. All the relationships have also changed as a result, and to have that happen this late in a series is almost unheard of." So what can fans expect? "You'll see both of them negotiate this new information being out there. And I've heard that if there's any major theme in this new season, it's to do with love - its meaning, its nature, familial love, romantic love, all kinds of love." You excel at playing these wild characters. What's the wildest thing you've done recently? (Laughs) "I got a tattoo on my foot. It looks like a mixture of a doodle and the map to an alien planet. That was pretty crazy!"